We all need to think about an Estate Planning checklist at some point -- like NOW! We can leave this earth at any point, right? You've accumulated savings and "stuff" over a lifetime - why not allow yourself to decide who gets what? Death is part of aging, most of my parents friends (in their mid-80s) are gone. They've lost about 20 couples from their Vegas vacation spot over the past few years alone, one by one, but death is inevitable. We simply need to think a little about our posessions - before someone else gets that job. Just a little bit of estate planning gives you peace of mind! You can also get peace of mind from writing your own Ethical Will. Leaving your own "moral compass" for younger generations is a great gift to the family. First, if you are married, just consider, for one moment, the death of your spouse. WHEN should update your Estate Planning document? Many people wait until a big life event happens to make changes to their wills... consider these life events as they all majorly can affect your estate planning. Some of thse will not change your plans but some will... and only you and your specific circumstances will know that. 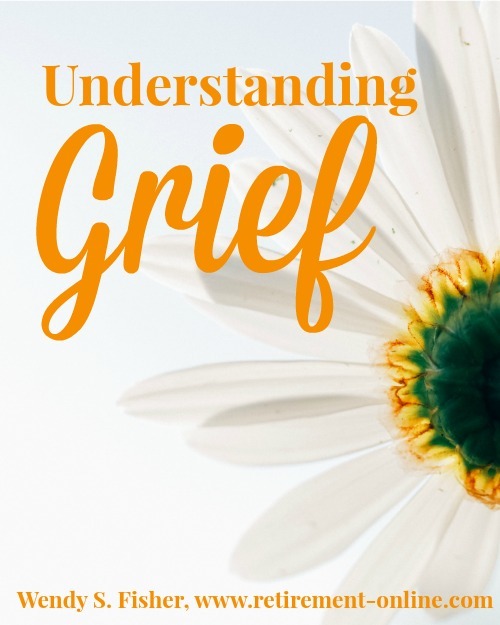 Inside -- you will find my Understanding Grief ebook and a second document with worksheets to help you think through the process. Click to purchase for only $5.00 and begin to Live your Life again! You will get a direct download link as soon as you buy it! You can now learn lots about wills on line, even writing your own wills with a do it yourself will (for smaller estates), or hire an inheritance attorney or probate attorney to get the job done right. Handwritten wills are accepted in some states. Do It Yourself Wills are relatively easy online. There are fill in the blank formats for wills online. I LOVE THIS... 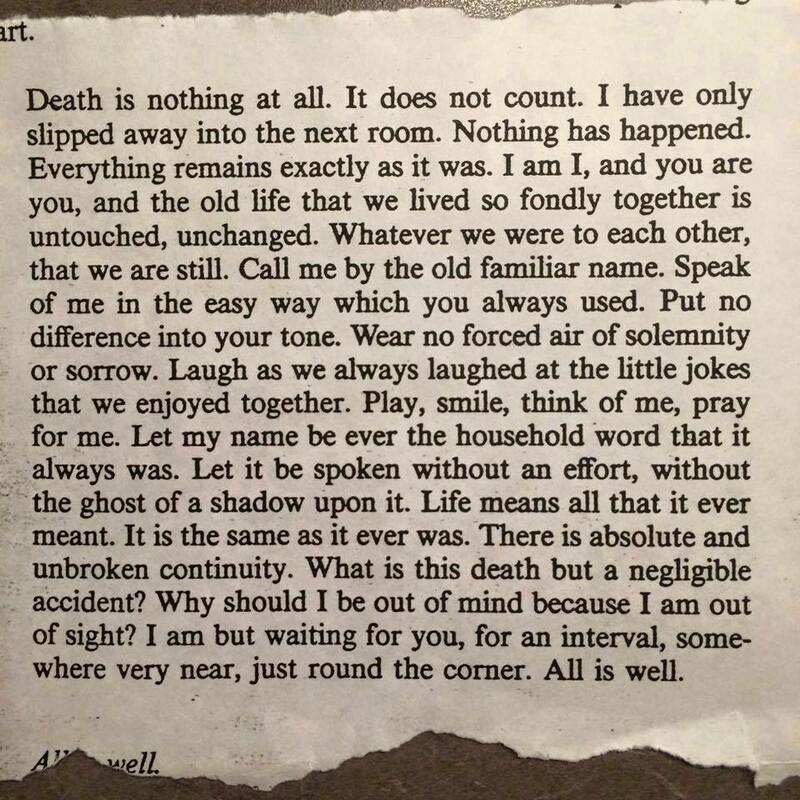 Beautifully Written by Henry Scott Holland (1847–1918) was Regius Professor of Divinity at the University of Oxford. Even if you feel you have no "estate" for planning, you don't have a home, IRA's and investments, you still have personal possessions that should go to whom you wish to receive them, right? Do you understand what happens when you have no will? Wouldn't you prefer to choose who gets what, instead of someone else doing that job? Your home, car, savings and such are the "estate" that probably need, in the least, a will that you've documented what you want done at your death. That could be relatively simple estate planning. Many of your investments like IRA's, 401K's, 403B's, etc, have a named beneficiary. They automatically go to that person if you die. They are outside of a will, they supersede the will, and are automatically distributed. Some pension plans, like defined benefit pension plans often provide a survivor benefit to a spouse, at the employees death. 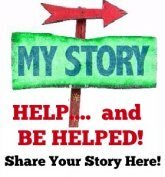 Then there is the Social Security survivor benefit to check out... hey, you need to know everything so you know what you are eligible should death of a spouse or family member happen. If you have no will, what happens? do you want that? I think not. This FREE Estate Planning Resource Guide was written by the State of Michigan... find one for your own state - OR - download it below and use the checklists and forms to get your estate in order. Enter for your search either (1) Michigan Estate Planning (or whatever state you are from) - or - (2) Michigan Do It Yourself Wills. I think you'll find oodles of information from your own State government. Each State is different so you do need to look specifically at your own State. Simple wills are easy to do online. If you are worried about it, do one, take it to an attorney to review it -- it will cost you lots less to have them review it, compared to having them use their will template and fill in the blanks for you. Do you realize that an Attorney is specialized like doctors? You wouldn't use an orthopedic doctor for a heart attack and you shouldn't use a criminal attorney for your estate. Seriously, use Google or recommendations from family or friends for an Estate Attorney... this is so important! Any Experiences with WILLS to Share? Estate Sales: Death and Your Belongings, Your Possessions, Your Stuff! Wills: Tell someone who your lawyer is! My Aunt's Will... she meant well.